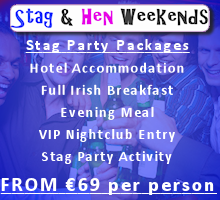 Stag Parties in Ireland are now the envy of the world, Ireland has built up a good solid reputation for developing the best stag party packages that can be found anywhere in the world, whether you are planning a Stag Party weekend or simply a day of activity and night of dancing you can be catered for. The Traditional stag party of drink and trouble have long sense left the stage, now stag parties are built around a good solid plan involving activities, dinning, good accommodation and all tastes are catered for. If you are the one designated to plan the stag party, it is no easy task, the groom to be will have watched the various programmes on TV about great Stag Party events, he will have Googled Stag party packages and so forth, so the bar is set high from the outset. In order to ensure success, you need to twin with a reputable Stag Party organiser such as stagandhenweekends.ie, state what you would like to achieve and let the organiser do the rest. Always use the inquiry form on the generic website, rather than adding to the cost of your package by making unnecessary phone calls, with clear requests, a package will normally be tailored to meet the requirements of your Stag Party. Planning the party of the year is definitely one of the perks of being a best man! You want to give the groom a day (or weekend) he’ll always remember, and that his friends will talk about for years to come. But believe it or not, the best stag parties don’t just happen… they need a lot of planning. We’ve got some tips to get you started! First of all you’ll need to figure out how many people to invite, and who they all are! This is one aspect of the stag weekend you should definitely ask the groom about – you might not know all his friends, and you definitely don’t want to risk forgetting someone and causing hurt feelings. Another thing to think about is inviting the fathers and male family members – it’s a nice gesture, but if they don’t seem like the partying type, they might prefer to come to whatever activities you have planned during the day, and give the evening shenanigans a miss. Unlike the wedding invitations, invites to a stag night or weekend don’t have to be fancy or formal. A simple group email or text will usually do the trick. Next you’ll want to think about when to have the stag night/weekend. The night before the wedding is never a good idea – nobody wants a killer hangover during the big day! We’d recommend having the stag do at least two weeks before the wedding… that’s plenty of time for the groom’s eyebrows to grow back, or for him to find his way back from whatever farmer’s field he was last seen in! When you’re talking to the groom and his mates, be sure to get an idea of how much people are willing to spend, and remember that the groom’s costs are usually covered by the rest of the group. That will give you an idea of what people can afford or will be willing to spend. Then you can figure out where you’re off to! Stag parties can be close to home in Ireland, further afield in Europe, or lavish affairs in destinations like Las Vegas or New York. The important thing to keep in mind is the agreed upon budget. If you’re planning on a weekend abroad, look for cheap flights and budget accommodation, and consider places with cheaper nights out. A “typical” stag do usually involves drinking and gambling. And drinking. Some guys have house parties, others hit the town for a big night out. Popular activities for the daylight hours can include paintballing, rock-climbing, skydiving, quad-biking or surfing. If you plan on a two night stag party, don’t overdo it on the first night and be so tired and hungover that you don’t have the stamina for the rest of the weekend. Remember – for all of these activities you’ll also need to think about how everyone’s going to get around (carpool / taxis / limo / bus) and where you’ll be staying (b&b / hostel / Hotel) and factor them into the budget. 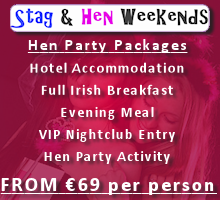 Have a blast, send the groom off in style, and remember that what happens on the stag do stays on the stag do! Oh yeah… and unlike in The Hangover… DON’T LOSE THE GROOM!